An extraordinary campaign calls for an extraordinary donor recognition plan. For our Year of Vocations we will commemorate our major donors with a truly unique and sacred memorial. All donors who pledge $3500 or more to our Vocations campaign will be given a gold placard to be displayed in the central entranceway at St. Augustine Friary—our Formation House—on a panel displaying six gorgeous images from the fresco series of The Life of St. Augustine, by the 15th-century Florentine painter Benozzo Gozzoli. These images will be high-resolution reproductions from the frescoes of the Church of St. Augustine in San Gimignano, Italy—an Augustinian monastery that dates back to the very foundations of the Order. Your name will be the placed within the central place of welcome in our Formation House, where the Augustinians Men in Formation pass each day as they leave for classes and return home. 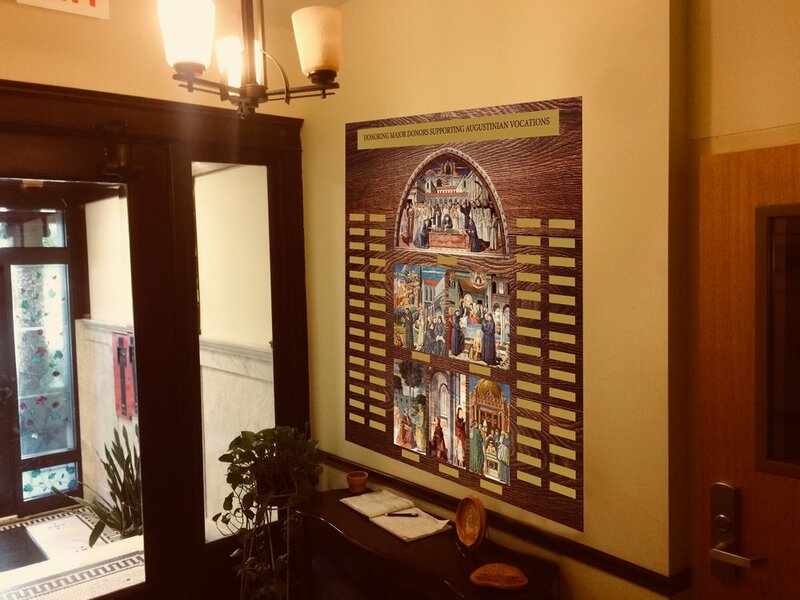 This Donor Wall will also serve as a daily reminder to the seminarians of the depth of their spiritual roots and the restless journey of St. Augustine, patron of the Order. Every moment of entrance and exit from the Formation House will give our friars an opportunity to remember your contribution! You will be invited to a blessing and unveiling of the new wall on November 13, 2018, the birthday of St. Augustine. The frescoes of the Life of St. Augustine are the most important and famous representation of Augustine within the Order. They were painted by the Florentine Benozzo Gozzoli in the 15th century for one of the oldest formalized Augustinian communities. The Church of St. Augustine in San Gimignano is place of pilgrimage for all Augustinian friars before they make their solemn profession of vows to the Order. This is little more than $3 per day! !